Maybe you’re kinda like me (or not) and just getting into the 2013 Stanley Cup World Series of Poker? It’s a long haul, sure, but know the basics of these stories and you can feel confident about having a pretty good grasp on how the deal has gone down at the WSOP this summer, and at least won’t sound like a total poker dunce while hosting your next weekly homegame and/or podcast. Two more tournaments of the Hard Rock Hotel’s Detox Poker Series are now in the books, with the defending CardPlayer Player of the Year making one the final tables. Event #8, $350 NL Holdem 6-Max, drew a field of 59 players, and when poker curmudgeon Sam Grizzle finished on the bubble, leaving the remaining six players in the money. In a two-way deal, Joseph Neiman was declared the winner over James Hoeppner, with Neiman earning $6,308. Full results and the winner’s photo available at the Detox Poker site here. Event #9, $350 NL Shootout, started with 34 players surrounding four tables, with the winners making the money. Notables who entered the tournament included Gavin Smith, Layne Flack, Jess Welman, Justin Young, Ylon Schwartz and Brian Micon. However, it was 2009 CardPlayer Player of the Year Eric Baldwin who won his table, guaranteed $1,020. Baldwin ran into the buzzsaw that was Derek Payne, eliminating the other three players to earn $5,100. Craig Doyle finished in 3rd for $1,530, while Dustin Lytle was runner-up, earning $2,550. The winner’s photo and the final hand can be found here. Two more tournaments get underway today, starting at 1pm with the $230 NL Holdem w/$200 Rebuy event. Players will start with 2,000 chips, with the rebuy giving you an additional 4,000 chips. There’s also a guaranteed prize pool of $50,000 for this event, with ~250 buyins/rebuys needed to reach the guarantee. The 5pm tournament is the $230 w/$200 Rebuy Pokerati Game NLH/PLO Championship. Like the 1pm tournament, players start with 2,000 in chips, with the optional rebuy giving players another 4,000 chips. Like the Pokerati cash game at the Hard Rock, it’s nine hands of NL Holdem, followed by nine hands of PLO. Be sure to check out www.detoxpoker.com for structures, chat, streaming video and more later today. The $1,000 Seniors’ No-Limit Holdem event drew a record 3,248 entries this afternoon when play started shortly after 12pm today. Not only was this a record field for a Seniors’ event, it was the largest field to start a tournament on a single day in poker history. The current leader is Team Pokerati and Loudmouth Poker’s own Tom Schneider with 29,000 in chips. Other notables include: “Minneapolis Jim” Meehan (16,000), Lon McEachern (14,500), Alan Boston (13,000) and TJ Cloutier (11,000). The field is currently on their dinner break with four levels remaining for the field to play. Follow the occasional updates over at PokerNews. The $10,000 No-Limit Heads-Up Championship drew a sold-out field of 256 entries, with two rounds scheduled for today. Winners of round 1 matches include Gavin Smith, Tom Dwan, Jason Mercier, Annette Obrestad, Josh Arieh, Phil Gordon, Blair Hinkle and Phil Ivey. The 128 winners will return at 10pm for round 2 action. See who moves on and who moves out at PokerNews. Follow the updates over at wsop.com. Christopher Gonzales (2,700,000) holds a large chip lead in the $1,500 No-Limit Holdem final day with 11 remaining. The field will be returning from dinner break shortly, see if anyone can run him down at wsop.com. Dinner break ends shortly for the 56 players remaining in the $5,000 No-Limit Holdem 6-max event, with 54 making the money. Matt Brady (465,000) holds a slight chip lead over McLean Karr (460,000) when play resumes. Other notables include David Ulliott (265,000), Christian Harder (255,000), Isaac Haxton (185,000) and Eric Baldwin (157,000). PokerNews will be there to follow the action when play resumes. The $2,500 Pot-Limit Omaha/Pot-Limit Holdem field is on dinner break with 54 players remaining, but only 45 make the money. Joshua Tieman is looking for his 2nd WSOP bracelet this year as he leads the field with 209,500 in chips. Victor Ramdin (155,000), John Kabbaj (98,000), David Chiu (87,600) and Burt Boutin (67,000) are among the notables looking to get a return on their investment when play resumes. The fine reporting team at PokerNews will be there to see who bubbles and who bounds into the lead. It looks to be a long night for some of these events to get finished, but for those who don’t want to stay up that late, another report will be forthcoming in the morning. Six players remain in the $10,000 Seven Card Stud event, with Men Nguyen the current chip leader with over 1,000,000 in chips. The rest of the final table consists of Nikolay Evdakov, Brandon Adams, Michael Mizrachi, Joe Cassidy and Steve Bilirakis. The first two to to cash from the final table are Vladimir Schmelev ($55,991) and Sirious Jamshidi ($46,206). 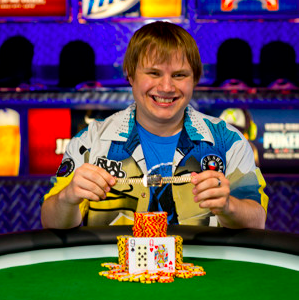 Follow the final table activities, and other WSOP events over at PokerNews. The final table of the $1,500 Pot-Limit Holdem event is down to heads-up, with James “Flushy” Dempsey holding the chip lead over Steve Chanthabouasy. JJ Liu fell short of triumph, finishing in 3rd for $86,512. Updates of the battle are ongoing over at PokerNews. Less than 100 remain in the $1,500 No-Limit Holdem, with chances appearing slim that a final table will be reached. Notables remaining: Blair Hinkle, Tom Dwan, Neil Channing, Roy Winston, and Alex Bolotin. The field in the $1,500 Limit Holdem event is down to 77 after their dinner break, with 63 making the money. Michael Miccio is the current chip leader at 85,000, followed close behind by Jameson Painter (82,000), Terrence Chan (81,000), Jason Potter (74,000), and David Plastik (56,000) in the top 10. Play continues until they reach the final table or around 3am, whichever comes first. More updates available at PokerNews. 1,922 handed over their money for day 1a of the $1,000 No-Limit Holdem event, a decrease from last week’s 2,600 day 1a. The remaining 450 players remain with play ending for the night when 15% of the field remains or 10 levels of play, whichever happens first. Some of the notable post-dinner break survivors: Phil Gordon, Kathy Liebert, John Cernuto, Tony Cousineau, Liv Boeree, and Vitaly Lunkin. A field of 250 players decided to give the $1,500 No-Limit 2-7 Lowball, Single Draw event a try, with notables such as Annette Obrestad and Eric Baldwin making their lowball debut. Players start with 1,500 in chips along with three $1,000 “rebuy” chips that can be used anytime within the first 4 hours. Nick Schulman appears to be the early chip leader with 25,000, but the volatile nature of the game means anything can happen over the eight levels of play this evening. Recapping the six-pack of tournaments in action this evening. But first more on Jeffrey Pollack’s employment with Professional Bull Riders with Michele Lewis and Wicked Chops Poker. David Oppenheim holds a commanding lead with five players remaining at the final table of the $50,000 Players’ Championship. Oppenheim currently has about 8,000,000 in chips with Vladimir Schemelev (3,000,000) John Juanda (2,000,000), Robert Mizrachi (1,400,000) and Michael Mizrachi (1,100,000) the remaining players as they go on dinner break. David “Bakes” Baker ($272.275), Daniel Alaei ($221,105) and Mikael Hurwitz ($182,463) were the first three eliminated at the final table. Follow the live reporting over at PokerNews. The $1,000 NL Holdem event is down to 18 players as they return from their dinner break shortly. The current plan is for a winner to be determined tonight, although they will reevaluate when they get down to nine.. The current chip leader is Samuel Paolini at 1,600,000, followed by Cory Brown (1,360,000), Dash Dudley (1,345,000) and Aadam Daya (1,100,000). CardPlayer POY Eric Baldwin is among the final 18 (740,000) as well as Gabe Costner (500,000) and Jeremiah DeGreef (355,000). Eleven players remain in the $1,500 Omaha 8 or Better event as the field returns from dinner break. Sasha Rosewood remains the chip leader (750,000), while Dan Heimiller (380,000) and Ylon Schwartz (120,000) the other recognized names in the field. The field will have a very late night as they play to a bracelet winner. The $1,500 NL Holdem event is down to about 80 with ten levels or they reach the final table this evening. Praz Bansi is the leader with 300,000, with Chris Moorman (240,000), Adam Levy (165,000) and Dwyte Pilgrim (160,000) near the top of the leaderboard. Updates on the action can be found here. The $5,000 NL Holdem Shootout drew a field of 358 situated around 36 tables, each playing down to a winner. Those who win their table are guaranteed $16,607, and move on to meet the other winners Wednesday afternoon. Some who have already moved on: Faraz Jaka, Neil Channing, James Akenhead, Chris Ferguson, Chino Rheem and Dario Minieri. To see who else advances, those updates are available here. The $2,500 2-7 Triple Draw Lowball event drew a field of at least 270, slightly higher then last year. It’s a little early for a clear leader to be established, but Andy Bloch, Sorel Mizzi and Team Pokerati’s own Julie Schneider are reported to have an above average 7,500 chip starting stack. The field will play eight levels tonight, more updates can be found here. The poker tournament circuit never stops though, as season 6 of the European Poker Tour holds their final tournament the â‚¬10,000 Euro Grand Final in Monte Carlo. Live coverage is available over at PokerNews and on the PokerStars Blog. The longest day of the $25,000 WPT World Championship at the Bellagio took place on Friday, as the remaining 10 players took their sweet time getting down to the televised final table of six. When play finally ended, it was Full Tilt Pro David Benyamine who was the chip leader by just 5,000 chips over David Williams, who eliminated an extremely short stacked Phil Hellmuth in 7th place. Video of that final hand appears below, thanks to a company called All360Poker, which has been filming select tables during the WPT World Championship, including yesterday’s table. It’s a 360-degree camera that shows the entire table, and allows the viewer to click within the image to select a different POV of the action around the table. Follow the live updates with BJ Nemeth, Jess Welman and the rest of the WPT Live Updates crew here. The first PokerStars.net NAPT event in the US got off to a roaring start on Saturday, with 872 players putting up $5,000 at the Venetian as part of their Deep Stack Extravaganza. 149 players started day 3 a few minutes ago, with 128 making the money. Hand for hand play has just begun, and the tournament staff is hoping to play down to 24. You can follow the action over at PokerNews, PokerStarsblog.com, or PokerListings. The winner when play ends on Thursday will collect $827,648. In other LAPC news, Al “Sugar Bear” Barbieri took down his 3rd preliminary event of this year’s LAPC, winning the $2,100 Ironman event, a tournament with no scheduled breaks. Barbieri pocketed almost $60,000 for the win, plus a seat to the $10,000 Main Event, which starts February 26th. The NBC National Heads-Up Championship is just a few days away, with the draw party on March 4th at Pure at Caesars’ Palace, followed by the tournament from March 5-7. The full list of 64 participants hasn’t been announced yet, but over 20 players already received their invite through a series of criteria, including last year’s winner, Huck Seed. Other automatic invites include: Phil Ivey, Joe Cada, Vanessa Rousso, Darvin Moon, Jason Mercier, Eric Baldwin, Sammy Farha, Bertrand “Elky” Grospellier, and Barry Shulman. One invitee who had to decline: Jeff Lisandro, who has a prior commitment in Australia which prevents him from attending. The EPT Copenhagen event, which drew 423 entries, concluded Sunday evening with Sweden’s Anton Wigg outlasting Italy’s Francesco de Vivo in a four-hour heads-up duel to win 3,675,000 Danish kroner ($6782,918). Other notables who cashed: Roberto Romanello, Peter Eastgate, Juha Helppi, and Bertrand Grospellier. Another good video from the LAPC … in this one Matt talks with Eric Baldwin (aka “Basebaldy), the 2009 CardPlayer Player of the Year. We, of course, got to know him as he was tearing through a Venetian Deep Stacks field prior to showing what he really was in town to do at the WSOP. In the above video they talk about Baldwin’s efforts to snap his 0-fer history at the LAPC and where “taking it easy” fits in to the upcoming Ironman competition. An eventful Day 1d field is off to their dinner break with a record field of 2,808 for a starting day of the Main Event (with several hundred left out) starting around 12 this afternoon. About 2350 returned from dinner break (as about 15% of the field has already been eliminated today). Some notable eliminations: Lyle Berman, Huck Seed, John Salley, Scott Montgomery, Dario Minieri, Eric Baldwin, Roy Winston and Peter Feldman. The early leader is Blair Hinkle with 120,000 in chips. Other notables with an above average stack: Chad Brown (105,000), Dutch Boyd (85,000), Shannon Shorr (65,000), Vanessa Rousso (64,000), Tom “Durrr” Dwan (55,000), Ron Kluber (53,000) and Phil Ivey (52,000). More chip counts and updates can be found at the wsop.com site here. More reactions to the Refusal at the Rio can be expected on Pokerati and various other places to discuss poker on the Internet in the late night hours.